Nabell Corporation has recently developed the nanoGrid, a portable solar power system that can generate and store electric power from sunlight and AC power supply. It features superior weather resistance and can charge electric devices anywhere, at any time. The nanoGrid is comprised of foldable solar panels that can neatly and easily be stored for later use. It even has straps to wear it as a backpack. The storage system weighs 6kg, with a folded size of 50cm×42cm. The nanoGrid is ideal for supplying electric power to devices ranging from PCs to LED lights to mobile phones. The best part about the technology is that it works in non-electric power source areas and even when presented with disaster conditions. In terms of outdoor leisure activities, it is designed for both convenience and practicality for activities such as camping. There are certainly other solar power systems out there, but they are large and cumbersome. The benefit of the nanoGrid is its portability and relatively small size. Advantages over other systems include the following. Because it can be folded and packed up tight, it is very compact and portable. It can easily be taken anywhere. This product does not require any other facilities, fuel or transmission lines; just sunlight. In fact, it has been proven to generate power even in shade. The nanoGrid can be a solution in rural non-electric power source areas. After extensive testing through bends and drops, the nanoGrid proved to be extremely durable against impact, heat and cold. It is also weather resistant, so rain will not affect its efficacy. nanoGrid is thought to be the most reliable resource of electric power when it comes to the challenges of natural disasters. The nanoGrid is a portable solar power system that can generate and store electric power from sunlight and/or AC power supply and charge electric devices anywhere anytime. The nanoGrid which consists of foldable solar panels and a storage system weighs 6kg in total, and the size is 50cm×42cm (folded). The nanoGrid can supply electric power to electric devices such as PCs, LED lights, and mobile phones not only in a non-electric power source area and under disaster conditions but also for outdoor leisure activities, as it is optimally designed for both convenience and practicality. Compared with other large solar power systems, our proposed small-scale system has the following advantages. The nanoGrid does not need any other facilities, fuel or transmission lines; it only requires sunlight* in order to generate electricity. * Verified that it can stably produce electricity even in the shade. Bend and drop tests were conducted under natural disaster conditions, and some tests are still ongoing. 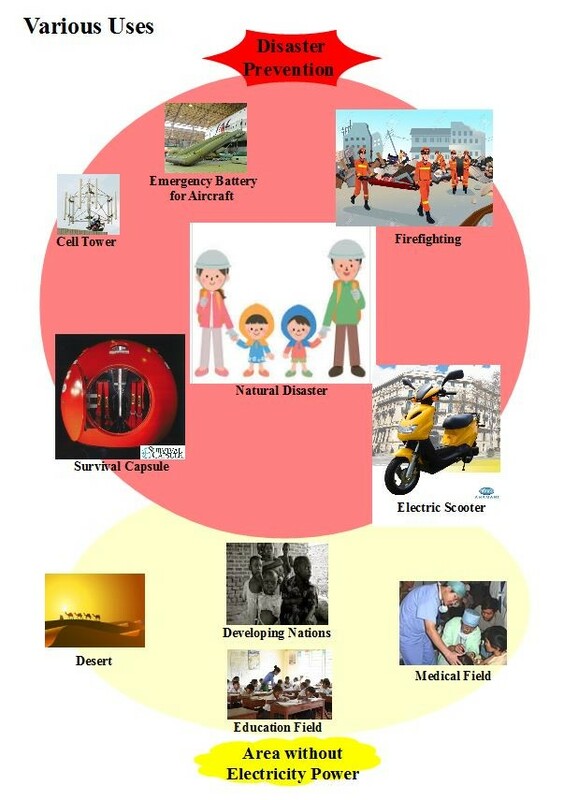 Due to these advantages above, the nanoGrid can be a reliable resource of electric power in the event of natural disasters. – Heat generation and ignition of lithium-ion battery. – Do not use or store our product in any high temperature environment and avoid close contact with heat sources or open flames. We are looking for a local business partner or a distributor who would actively support our business in sales and maintenance service. We can export our product: a complete set of ‘nanoGrid’ (solar panel, storage battery, AC charger, PV input harness, DC12V output harness and carry bag) directly from our company based in Japan.